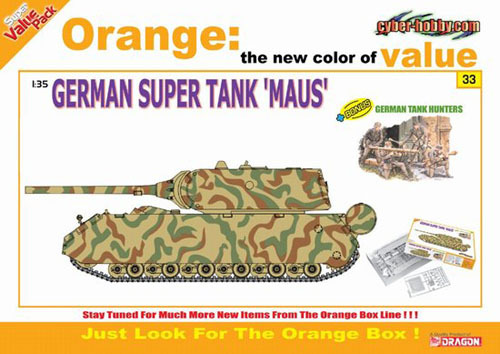 1/35 German Super Maus Tank Model Discounts Apply ! CHC9133 - 1/35 German Super Maus Tank Model, Plus German Tank Hunters Figure Set. Discontinued Item. Cyber-Hobby has come up with a real heavyweight duo in its latest 1/35 scale Orange Box item. The set contains the German heavy tank design known as Maus, while the accompanying figures are composed of a German tank hunter team. What could be more effective than this powerful combination? An impregnable tank and a mobile antitank team! The Maus tank, if it had been completed, would have weighed in at a staggering 188 tons. This super-heavy tank was armed with a 12.8cm gun and coaxial 7.5cm KwK44 cannon. Design work kicked off in 1942 under Hitler's orders, and the V1 prototype with simulated turret was tested in December 1943. It subsequently received a turret and was tested in June 1944. However, such an iron behemoth was understandably beset by mechanical and engine difficulties, and the prototypes never saw combat. Nevertheless, Dragon's classic kit of this unique vehicle accurately depicts what the Maus could have been had it entered German service. Parts fit together easily to create the monobloc appearance of this mighty vehicle. The vehicle is protected by a team of German soldiers armed with a range of late-war antitank weapons such as the 8.8cm Panzerschreck and Panzerfaust. The figures are sharply sculpted and are depicted in realistic poses. Being the first time that Orange Box has released such a heavy tank, this super-heavyweight set possesses a decisive one-two knockout punch. Yet despite the enormous size of the contents, the price of the 1/35 scale set remains commendably modest!